Starting a digital marketing agency is easy. Hang your shingle, define your expertise, and you’re in business. But they don’t tell you about the bumps in the road, the challenges you’re going to face, and how to lean in and push through them. I run a $4M+ agency with 42 people on staff. We’ve been named Partner of the Year by HubSpot. We’re certified as a Great Place to Work. And we’ve been recognized for our company culture and the opportunities we provide women. And maybe find some answers to grow your digital marketing agency, too. In all honesty, for the first 6 years as an agency owner, I had no idea what I was doing. I didn’t know how to find good people for my team—nor how to keep them. The work we did was okay, but nothing to write home about. There were months I didn’t pay myself, and my annual salary was laughable. I started IMPACT in 2009 as a one-man show. I had been working at a manufacturing company, doing freelance website design projects on the side. But my freelance work was doing well enough, I felt it was time to leave and do my own thing. To find work, I went to a lot of Chamber of Commerce events and literally knocked on doors of local businesses to get whatever business I could. Soon my business grew enough that I was able to hire someone to help. Of course, we didn’t have an office yet, much less office furniture. We worked out of my condo for several weeks until we got our office space. And once we got more website projects, we were able to get some office furniture. Then we hired some interns, got some more clients, and continued to grow. This is the IMPACT office around 2012. We were your typical grass-roots, self-funded digital marketing agency. Our focus: web projects. Trying to understand the problem, I asked clients to explain. “We thought we’d get more business from the website,” they told me. Clearly, I needed to help them get better results, so I started researching ways to make websites work better. That’s when I found myself on HubSpot’s blog. Soon, I was on the phone with them, listening as they told me what it would be like to be a HubSpot partner. “What’s inbound marketing?” they asked. Revamping our agency took work. We’d work all day then stay up all night watching videos and webinars. That was the moment when everything changed. To learn what inbound marketing was, how to use HubSpot, and how to sell it. We’re very visual people, so as we figured things out, we laid it out in a graphic. But remember, we were new to inbound marketing, so we weren’t sure it was right. We sent it to HubSpot for feedback. Not only were we right, they told us that if we turned it into an infographic, they’d publish it on their blog. It was the perfect storm: Pinterest had just come out and was really popular. HubSpot and Inbound were really popular. Infographics were a new medium that everyone loved. This put us into the top tier of the HubSpot Partnership Program. I was named the Rookie of the Year. We were taking off, and I staffed up again. Now we were a team of 23 people, and almost overnight, we got to about $2M in revenue. I was asked to present to the agencies at Inbound ’13 on how agencies can position themselves for larger retainers and growth. I was making a lot of mistakes. My biggest problem was not knowing how to handle bad employees. For example, I had a salesperson who had been underperforming for some time. We weren’t getting along, and it just wasn’t working out. I knew I should have fired him long ago, but I hadn’t done it yet. It came to a head at Inbound, where I was making my presentation. There, in front of our team and the other attendees, this employee and I got into an altercation. It was embarrassing. It was bad for morale. And I still didn’t fire him! It started a subculture of negativity in the company, which went on way too long. When I finally did fire him, I had to let a whole group of people go with him. Unfortunately, it took my team by surprise, and since it happened so quickly, the negativity continued. The people I let go were still bad-mouthing us, and those who stayed with me didn’t know what to think. Worse still, they didn’t trust me. Over the next few years, we made more bad hiring decisions. We had to let more people go. And there was a $2M ceiling we just couldn’t break through. Then, in the summer of 2015, we hit rock bottom. At this point, not only did we have a lot of employee turnover, we had client turnover that translated into a loss of $27,000 a month. That summer, we lost 21 employees, leaving us with a team of 23 people. We also lost 19 clients, more than half of our average retainer. The financial impact was $2M of lost revenue and missed opportunity. We started by getting the wrong people off the bus. Any employee who was underperforming or wasn’t a good fit was let go. But this time, we did it better. Everyone who went knew WHY it was happening and what they’d done wrong. We also helped them find new jobs by helping them update their resumes and giving them references. Then we got the right people on the bus. We added people to the team who knew their job better than I did. They were professional, easy to work with, and cared about the work they did. This helped everyone see what we were working towards and how they fit into the big picture. After getting our team right, this was the most important thing we did: We created a written document of our vision and goals, and what the company was going to look like in a few years. I then presented that to the company, getting their input and buy-in. This helped everyone see what we were working towards and how they fit into the big picture. Next, we rebuilt our leadership team and brought in the right advisors. We brought in Jack Carroll as a sales consultant. Not only did he help us refine our presentation and close more deals, he helped us set client expectations and communicate with them more clearly. He also helped us identify an internal problem: stress, which led to complaining, which was a symptom of a bigger problem—lack of business maturity. We implemented 1-on-1s to help manage internal stress, which gave the entire team the capacity and maturity to do their best work. That was one of the most important things I could have done to earn the trust of my team. I worked on myself, too. I invested in a 360° survey so I could understand what people really thought about me and my leadership style. It’s painful to realize that the way you think you’re presenting yourself isn’t how you’re being received. But it gave me valuable insight. I was able to identify the issues that were making my team unhappy and let them know I was working on them. That was one of the most important things I could have done to earn the trust of my team. Finally, we focused on improvement. Instead of focusing on the size of our agency or how quickly we were growing, we focused on being the best. This was all about improving the quality of what we do. 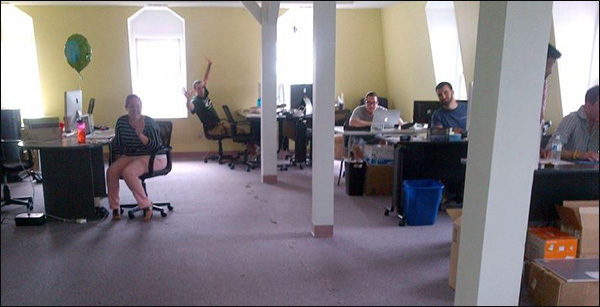 The year following our housecleaning, no one quit the company, no one retired, and we grew—without having to add to the team. The 4th quarter of 2015 was the best quarter we’d ever had. The 1st quarter of 2016 was even better. And since then, it’s been all growth. Some of this growth was fueled by an acquisition we made in 2017. It added 3 new people to our team who were rock stars. Growth Tip: having the right people on your team is jet fuel for your agency’s growth. As you’ve seen, we made a lot of mistakes along our journey. Fortunately, though, not everything we did was a mistake. There were a few things we got right. Our first hire was Tom DiScipio. He’s still with us and is probably one of the most important people in the company. People always ask me who their first hire should be. They want to know what qualities they should be looking for. I think of Tom as the perfect example. He had a few years of experience, so he came in with business maturity. He was still young, so he was affordable. He had leadership potential, and I knew from talking to him that he could eventually lead an entire department. When you’re ready to hire, look for someone who has enough experience they can hit the ground running. And make sure they can help you manage your clients on a day-to-day basis. Our second hire, Natalie Davis, was also a good decision. She started out as our receptionist, then did our social media for us. And when we became an inbound agency, she was our first Inbound Marketing Consultant. But where she really shines is this: she’s the voice of our employees. Natalie has high trust with everyone on the team, and when they have a problem, they talk to her. She’s then able to bring those problems to me and help me figure out how we can create a better work environment and make this the best place to work. That’s her passion. She’s the reason we’ve been recognized as the Best Place to Work and the Best Place for Women. She’s also the reason we have such a great remote culture. Thanks to her, our 15 remote employees feel like they’re an integral part of the company and don’t feel isolated. You’ve heard that the cobbler’s kids have no shoes. Well, that’s not the case for our agency. Our kids have Air Jordans. We don’t just do marketing for our clients. We’re heavily invested in marketing ourselves. Even when our team was small, we had 1 full-time person dedicated to marketing. When we hit 15 employees, we had 2 full-time marketers. This year, we plan to add even more people to the marketing team. Even at our low point in the summer of 2015, we had 5–10 consultation requests asking about our services each week. At that point, we had about 75,000 monthly visitors to our site. Today, we have 360,000+ monthly visitors, with 6,000 new monthly subscribers (green = organic traffic). Your story may be similar to ours. Or your problems may be vastly different. But the 6 lessons we learned should apply to everyone. These are the lessons in marking we’re never taught about growing a digital marketing agency. Your staff are the touchpoints for your clients. Your staff are your product. They’re the ones your clients are talking to, asking questions of, and getting answers from. Your staff are your product. In our agency, our clients are smart. They’re VPs and directors who know a lot about marketing and where the world is going. They hire us because they want someone to brainstorm with, to keep them up-to-date on what other brands are doing, and to feed them really good ideas. They want to work with a peer, not an entry-level worker. So, we have to hire the best people we can find. Choose your team members wisely. Be sure they can do the job and be highly effective. Your goal is to onboard them and put them in front of your clients within 30 days of hiring them. Hire for skill and culture. They need to align with your values and have a shared purpose, but they need to have the skills to do their job well. 1-on-1s are critical. We have 30-minute 1-on-1s every 2 weeks. What are the problems your team members are struggling with? What do they know that we don’t know? How are we coaching them to get them to the next level? That’s the focus during this time. Get good at firing. That sounds cruel, but it’s not. When people are underperforming or aren’t a good fit, they’re holding your company back and the rest of the team. You have a responsibility to put those underperformers in a role where they can succeed. If that’s outside your company, it’s important to help them make a smooth transition. Your people need to see their future at your agency. When people don’t see how they fit in your future, they don’t stay. I’m assuming you know what your agency will look like in 3 years. Most of us do. But if you asked your employees, would they know? Or would they say something different than you? As a leader, it’s important to let your team know where you’re headed and how they fit into your vision. We’ve learned the hard way: when people don’t see how they fit in your future, they don’t stay. Create a 3-year vision. This is long enough to get something done but not too long. Ask for input and commitment from the team. Keep it alive. All objectives need to help you reach that vision, and you need to measure your progress. Objectives are the goals you set to help you reach your 3-year vision. But you shouldn’t set random objectives. To know what they should be, work backwards from your 3-year plan. 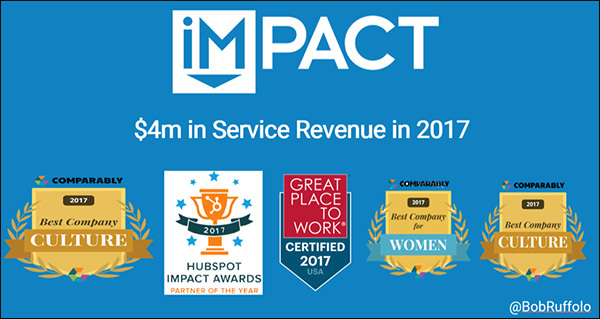 So, let’s say that, based on IMPACT’s 3-year plan, we have 5 high-level objectives that the entire company is structured around. To manage these objectives, we use the Entrepreneurial Operating System (EOS), assigning a leadership team to each objective to make sure we continue to improve in that area. We assign a department head to each of them, then we build our teams around that. Now let’s go down another level. Here, we set OKRs (objectives and key results) for each objective, which we update every quarter. This is a really simple process. Each department head is responsible for one objective, and they have their own key results to work on. The key results are then re-set each quarter based on what they need to work on. We’ve been managing the business this way for 3 years, and this is how we get traction. We put these objectives in place, structure the leadership teams, and everyone rallies around them to make sure we’ve reached our goals. We ask a lot of tough questions in the survey because we want to extract all the things that are bothering our people. Like the 360° Survey I did when I was working on myself, the truth sometimes hurts. But we can only fix problems if we know they exist. 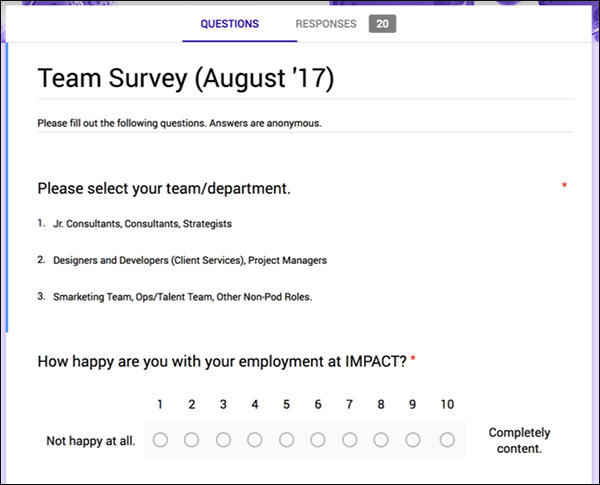 Here’s an example of what our Team Survey looks like. When we fix these types of problems, that sends a strong message to our team that we care, and that’s important for building a positive culture. These are the things we heard from you. These are the things we’re going to work on now. These are the things we’re going to put on the back burner, and we’ll get to them later. We can (and should) be a community that works together to help one another. I can’t tell you how many times I’ve called someone to ask what my next steps should be, how they did something at their agency, or what’s working for them. You need to be learning constantly. We’re entering a new level of IMPACT with a new 3-year vision, so I’m talking to Ann Handley and Joe Pulizzi to understand how they grew MarketingProfs and Content Marketing Institute. I’m talking to Ryan Deiss about how he did things with DigitalMarketer. You’re learning things too, and we can help one another. So, ask for help, but remember to pay it forward and help the people who come to you with questions. If you learn something, share it. Entrepreneurship is tough. Growing a digital marketing agency is one of the biggest challenges you can face. Along the journey, stop, take a deep breath, and enjoy it. Growing your agency is a lot like a video game. Every time you progress to a new level, it gets hard. You find yourself struggling to figure things out, and you feel like you’ll never beat it. But you do end up beating it. And when you do, you progress to the next level, where it only gets harder. That’s how the game goes. Accept the challenge and enjoy the ride. The post 6 Lessons in Marketing: What They Never Taught You About Growing a Digital Marketing Agency appeared first on DigitalMarketer. Drag and Drop Web Based Software - Instantly create e-book, kindle, cd, or software covers in minutes. Includes 250 done for you e-covers, 3,000 Unique Combinations in total! *LAUNCH SPECIAL* Includes Commercial/Enterprise License! Try Faster Smarter Better NOW! 7 Days Risk-Free and Full Access Trial For Only $1.00!